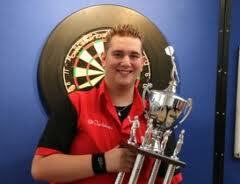 Kevin Münch comes from a family of dart players and was many years the German Youth player number 1. He was quite successful internationally as well. After his 18. birthday he switched to the seniors and from this time on he and Marko Puls alternate as the number 1 of the DDV ranking. Münch won in November 2011 the German qualifier for a place in the preliminary round of the PDC World Championship 2012. Outside of darts Münch is interested in basketball and soccer as well.